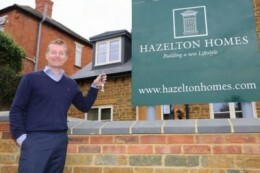 Buyer finds “perfect fit” with Hazelton Homes on his return to the UK. A man who spent six years working over 3,500 miles away in Kuwait has found the “perfect fit” on his return to the UK thanks to Hazelton Homes. 37-year-old Keith Potter, who works as a Logistics Manager for CSM Logistics in Northampton, returned to the UK after working in a similar role for DHL in his time overseas. He moved in to his new two-bedroom townhouse at Spratton Mews, an exclusive development of 11 homes in the heart of Spratton, at the start of August. Keith said that he was happy to find a newly built home with a bit of character. He said: “When I was searching for a new home, I wanted something which wouldn’t require a lot of maintenance, and something away from the hustle and bustle of a big city. “I had a look around some other developments in the area which were very large and all the houses looked similar, but the homes here are a real niche. They are new builds, but they have plenty of character, and that was something which really appealed to me. “The house itself is perfect for me. I got to choose the style inside the house, like the tiling in the kitchen, and little things like having underfloor heating make it a great home. He added that he was very happy with his property and that the team at Hazelton’s had provided a very good service. Keith used the government’s Help to Buy scheme to purchase his first home since coming back to the country, something which he said was a “no-brainer” for him. The scheme allows buyers to purchase a new home worth up to £600,000 with just a 5% deposit and a 75% mortgage. The remaining 20% is covered by an equity loan which is interest free for the first 5 years. Both two and three-bedroom townhouses are still available at Spratton Mews, which is based on Manor Road, in the middle of the sought-after Northamptonshire village. For more information about Spratton Mews, visit www.hazeltonhomes.com, or call 07850 770335.